Shelley Moore - What is Inclusion? Many learners with FASD struggle with social skills due to difficulties with social awareness, complex expression of feelings, understanding directions, social cues and fast-paced conversations. 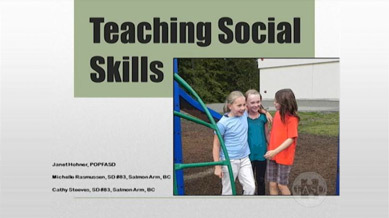 In this module, we highlight a framework for working with learners with FASD to help them acquire the social skills needed to live and succeed in their day-to-day life in elementary school.